Havering Council is flying the rainbow flag at the Town Hall in Romford this weekend to mark the start of LGBT History Month. 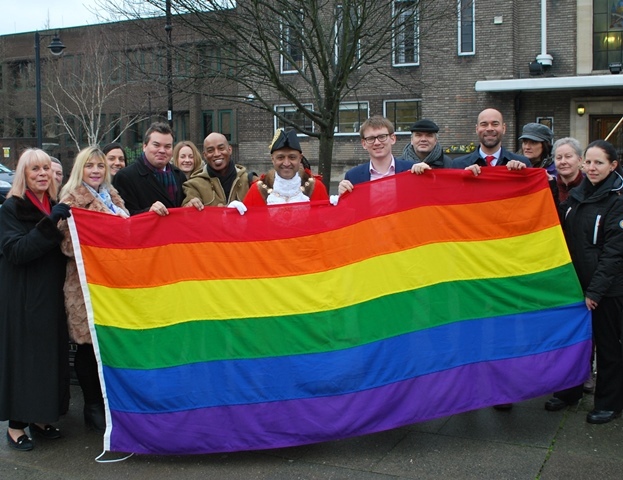 The Leader of Havering Council, Cllr Damian White, joins the Mayor, Cllr Dilip Patel, at the flag raising ceremony to mark the start of LGBT History Month. At a special ceremony held on Friday morning (1 February) at the Town Hall, Romford, Councillor Dilip Patel, Mayor of Havering, and Councillor Damian White, Leader of the Council, were joined by Council staff, ward councillors and residents, to raise the flag and celebrate the start of a month of events to be held in libraries across Havering. The Wishing Tree exhibition will be coming to Romford library and installed on Tuesday 5 February. This was created by the community at the first-ever Romford Pride event in July 2018 and has people’s hopes and wishes pinned to it. Author Jonathan Kemp will be coming to talk about his book London Triptych at Rainham Library on Friday 15 February at 7pm. All library branches will hold a rainbow craft drop-in session on Saturday 16 February from 10.30am-12noon. A health and well-being drop-in event will be held at Romford library on Monday 18 February from 1-4pm with organisations including Mind, Samaritans, Positively East and Sycamore in attendance. Vernal Scott will be holding a talk at Hornchurch library entitled ‘LGBTQ+ communities, then and now’. Vernal will discuss about the struggles, perceptions and aspirations of LGBTQ people. His presentation will include readings and a discussion covering health, politics, and modern role models. Vernal will also be asking the big question: Where do LGBT people want to be in 10 years from now? This will be on Thursday 21 February at 7pm. All Havering’s libraries will have book displays to mark the month and library staff will be encouraging an LGBTQ+ reading group to start meeting regularly. “We’re proud to fly the rainbow flag in Havering to recognise LGBT History Month.